Just yesterday, I was on the last few miles of a long run. I was delighting in the spectacular weather and admiring the mountain view as I ran along a popular dirt road toward the Boulder reservoir. I ran toward traffic as is customary. A cyclist was coming toward me. I expected her to move left as cars and cyclists usually do. She did not budge and screamed at me several times, “I am not moving over.” I was confused and continued running. We came to a standstill when it was clear that neither of us was going to budge. She got off her bike and proceeded to screech, “You do not belong on the road. You should be running over there (she pointed to the heavily weeded ditch off the road).” I did not lose my cool, but I did explain that runners are allowed on the road and the ditch is filled with snakes anyway. Resolution was never achieved and I finally went around her. Given that there were a ton of runners out that morning, I wonder if she stopped and lectured at all of them. Last week three cyclists in Boulder were hit head on by a car that swerved into their bike lane. The article that appeared in the Daily Camera outlining the details of the accident made it very clear that the cyclists were NOT at fault and the driver of the car was reckless. Nonetheless, the comment section was replete with people that clearly hate cyclists and used this incident to express their views even going so far as to blame the cyclists. There was an overwhelming theme that cyclists do not belong on the road. There is so much anger and animosity between cars and cyclists, cyclists and runners, runners and walkers. Why? I am completely baffled that someone can become so enraged at a person they do not know who has done absolutely nothing other than occupy the same space.What mechanism compels a person to yell at a stranger? There are no simple answers to living more harmoniously. Angry people will probably continue to be angry no matter what. But, I do think there are some steps that we can take as athletes to make things easier for all parties.At the very least, we can then say we did absolutely everything to avoid trouble. 1. Obey the rules of the road. Cyclists have a tendency to use red lights as stop signs and stop signs as yield signs. If we wanted to be treated as a vehicle, we must act like one. 2. Single up when cars are coming. While it is legal in Colorado to ride two abreast, make it easier on the cars by singling up when they are trying to pass. 3. When using trails, be aware of the people around you. If on a bike, don’t speed around blind corners. Whether on a bike or running, let people know if you are passing. A simple “heads up” or “right behind you” alerts people that you are there and they usually appreciate the notice. 4. In Boulder, trail rules state: everyone yields to equestrians, bicyclists yield to pedestrians, and bicyclists headed downhill yield to bicyclists headed uphill. However, I often move to the side when the bikers come through as it easier for me to stop or move than it is for them. 5. Always give a wave or verbal thanks if someone does something you like. Positive feedback goes a long way. 6. Try not to use obscene gestures to express your anger. We are all guilty of losing our temper when someone does something that makes us feel threatened. Providing negative feedback will only make that person more apt to do something offensive again. 7. Pay attention to your surroundings. I am not a believer in wearing headphones while out on the road. It dulls the senses and makes quick reaction more difficult. Look, I know that no matter how hard we try to co-exist with cars, bikes, runners or walkers there will always be hostility. I also know that there is plenty that cars can do to help us out, but that is a whole other post. The best thing we can do is to do our best to be considerate of each other. Well, put. I often use this rule: Just because I can legally be here, does not mean that I shouldn't yield, anyway." Let's just be nice. You answered your own question. There are too many motorists, in particular, that self-righteously INSIST on their right to be inconsiderate, at best and venomously hateful at worst. They BELIEVE might makes right to such an extent that they have no question that no one not in a motorized vehicle belongs on or anywhere near the roadway. That is a failure that starts at home and carries through any kind of driver training and the DMV. Here in redneck-land just take that to the 10th power. Many of them think it's just so cool to harass runners and cyclists. The cops are no help – they come from the same population. Finally, it seems that no one can drive now with out or talking/texting, i.e. drifting mindlessly down the road. Sc won’t even legislate hands-free. It is my natural tendency to be aware, focused and considerate. That matters not at all in these equations. All I can do is defend my as best I can when the inevitable attacks come. Fantastic post! As a triathlete I agree with every word you wrote. Great job! I'm a triathlete and find that there are many park roads and trails to ride my bike at safely. It may not be as convenient as riding from my door but if I don't have time to travel to a park I ride on my trainer. Cyclist seem obsessed with their right to the road but I prefer to be in control and not leave it up to someone that is driving something that can kill me to do the right thing. Also, why do so many pick roads with speed limits over 25-35mph? I'd never ride a road with multiple lanes of directional traffic. There is a guy I see riding down a 4 lane 45mph and wonder why, 1 he thinks it's a smart idea, 2 even enjoys riding with the majority of people coming extremely close while passing, 3 knows that a half mile over there is 25 mph 2 lane road 1/2 mile over. Maybe he just wants people to see him on his sweet Cervelo but most people have no idea or care about his top end bike. Wouldn't it have been easier to move over for the cyclist and avoid a dispute? As for the chick with the dog, she should have to give it back to where ever she got it she doesn't deserve one. I know I prob sound like a bike hater but I got hit once when I was younger and it's not worth it. as the law pertains to #2…. 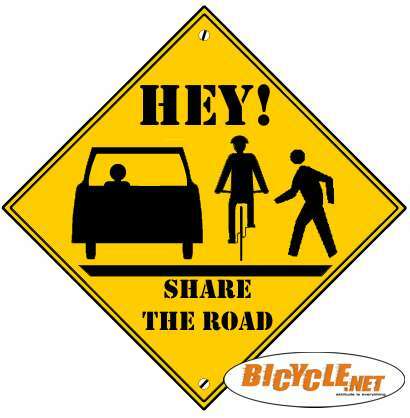 on a road with no shoulder it is okay to ride two abreast but when a car approaches you must single up. the thing i dont get is the single file sign in LHC….the shoulder is plenty wide for two folks, no? I agree, often cyclists ride on roads that are too busy when alternative options are easily available. Getting hit certainly changes one's perspective. We need to adopt the attitude that we deserve to be on the road, but we do not own the road. I have to say that I often feel like I'm in the minority of cyclists who actually obey the laws of the road. I've seen so many cyclists who blissfully disregard traffic, ride 2 and 3 abreast, and then give the classy one finger salute to anyone who honks at them. It really makes me sad that many riders are giving drivers even more reason to hate us. I think too many cyclists take themselves too seriously and think their training ride is more important than being positive ambassadors of the cycling community. Thanks for the rules! While cycling on a shared path, I was blindsided by a runner with headphones when he suddenly turned and pushed me and my bike into a large steel pole. I hit the pole and flew to the ground. My ear was crushed and blood was coming out of my helmet- the runner stayed lying on the ground for awhile from the impact. But he walked away relatively unscathed. I hope he remembers to leave his headphones at home, or on low, next time he runs on a shared path without looking before he turns.